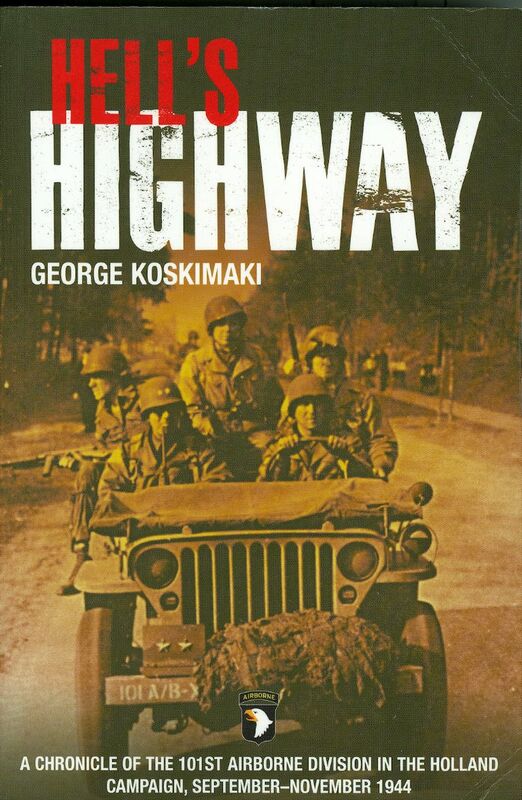 Hell's Highway by George Koskimaki - Jimmie Aaron Kepler, Ed.D. George Koskimaki was 101st Airborne Division commanding general, General Maxwell Taylor’s radio operator. He wrote the three-book history of the 101st Airborne during World War Two. Hell’s Highway: Chronicle of the 101st Airborne Division in the Holland Campaign, September – November 1944 is the second book in the series. I had previously read Cornelius Ryan’s “A Bridge to Far”, Stephen Ambrose’s “Band of Brothers” and “Citizen Soldiers”, Robert Kershaw’s “It Never Snows in September: The German View of Market-Garden and the Battle of Arnhem, September 1944”, Martin Middlebrooks’s “Arnhem 1944: The Airborne Battle” (focusing on the British specifically at the Arnhem sector), and James Gavin’s “On to Berlin”. All of the books gave good presentations and different points of view of Operation Market Garden. George Koskimaki’s book is based on interviews with more than six hundred paratroopers journals the soldiers intense personal accounts. It gives the vivid previously untold versions of the Screaming Eagles’ valiant struggle. Hell’s Highway gives us something not covered in the other books. It tells of the Dutch people and members of the underground and their liberation after five years of oppression by the Nazis. It shares how they have never forgotten America’s airborne heroes and how the 101st endangered and even sacrificed their lives for the freedom of the Netherlands and Europe. While some readers may find the book hard or even tedious to get through because of the detail, I did not. The personal accounts gave vitality to the story. It kept it flowing instead of reading like a military after action report. Mr. Koskimaki did a superb job of telling the history the 101st Airborne Division during Operation Market Garden. The book is just right for beginners and experts of the 101st Airborne Division. The three books George Koskimaki wrote on the 101stAirborne Division are 1) D-Day with the Screaming Eagles, 2) Hell’s Highway: Chronicle of the 101st Airborne Division in the Holland Campaign, September – November 1944, and 3) Battered Bastards of Bastogne. I highly recommend the book.